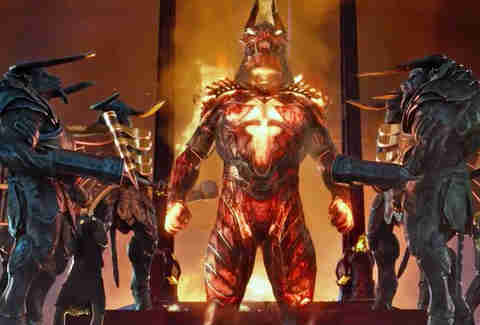 Gods of Egypt is a movie about gods who are much taller than humans, transform into flying Beast Wars-style robots, and bleed gold blood. For reasons only producer and director Alex Proyas may fully understand, it cost $140 million to make, and it's already on track to be one of the year's first big box office flops. It is a fundamentally ridiculous and goofy movie that bears no relation to either Egyptian history or the real world that we live in, except for one thing: Gerard Butler's performance as Set, the god of darkness, might remind you of a certain Republican presidential frontrunner. Set is here to make Egypt great again. No, the chiseled Butler does not physically resemble Donald Trump. He's not wearing a ridiculous hairpiece, using the word "yuuuuge," or calling people losers from a podium. For the first time in his career, Butler's work is subtle. 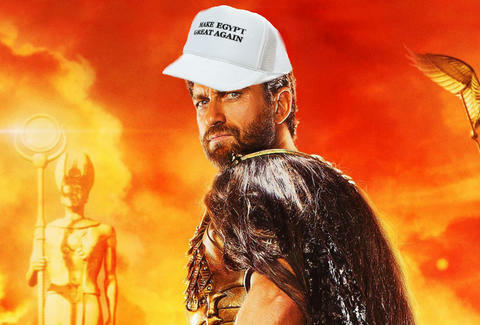 On the surface this might look like a movie about feuding robot gods, but if you look close enough, Gods of Egypt is an absurd parable about Trump's vision for America. Or, maybe all the CGI fire melted my brain -- let's investigate. Like Trump, Set knows how to get into his opponent's heads: intimidation. When the movie opens, the god Osiris (Bryan Brown) rules over Egypt with a mix of kindness, sweeping hand gestures, and a very clear height advantage. Getting late in god years, he's ready to give away his kingdom to his son Horus, the god of air played with a charming brattiness by Nikolaj Coster-Waldau from Game of Thrones. But, then Butler's Set, the much younger (and more Scottish!?) brother of Osiris, shows up and kills Osiris, snatches out one of Horus's eyes, and basically takes over Egypt. The guy doesn't even have to caucus. If you've been watching the primaries play out in South Carolina, Nevada, and New Hampshire, this should be familiar. Horus, like Marco Rubio, Jed Bush, or any other Republican establishment hopeful, thought he had this all wrapped up. Then this brutish goon showed up and started pushing everyone around. And, man, does Set have a Trump-like ego. At one point one of his servants says, "You look glorious," and he grins before saying, "I know!" If you know anything about Gods of Egypt, it's probably that the movie has faced rightful criticism for its whitewashing of history. And, man, those early critics were right: this is a very white Egypt. This means that Set's followers are almost all white, much like the smiling faces at a Trump rally. One does have to wonder if 20% of Set's supporters, like Trump's fans, also think freeing the slaves was a bad idea. Yikes. Gods of Egypt is the closest thing I've seen to a gold-plated movie. Every part of it is shiny and opulent, like the sets and costumes were designed by the dudes from Pimp My Ride. This photo could've been taken on the set. Much like in the election, cash rules everything around Egypt. One of Set's first moves as a ruler of Egypt is to change the rules of how you can get into the afterlife. While under Osiris mortals could get into heaven if they performed good deeds, Set makes it so you need to pay in gold. And, like Trump, he's obsessed with big buildings. Looking outside his window at a giant tower, Butler asks his master builder, "Can you make it any taller?" Obviously, this guy needs to read The Art of the Deal. There's a lot of weird crap that happens in Gods of Egypt. I haven't even mentioned the thief named Bek (not Beck, sadly) played by Brenton Thwaites, the campy performance from Get On Up's Chadwick Boseman as the god of knowledge Thoth, or the part where two female goddesses (Abbey Lee and Yaya Deng) ride fire-breathing snakes. All of this happens. None of it makes sense. But even those goofy moments can't hold a flickering CGI candle to Geoffrey Rush's hammy take on Ra, the father of Butler's bad boy Set. Having served time in the Pirates of the Caribbean franchise, Rush is no stranger to silly costumes, swashbuckling action, and paragraphs of expository dialogue. But his performance here is something I've never seen before: he looks like the flame emjoi brought to life. And, oh yeah, he navigates a giant spaceship boat that tows the sun and he does battle every night with a giant black cloud demon that threatens to destroy the universe. I think? It's all pretty confusing. Encased in bright orange CGI fire, Rush needles Set for his selfishness. 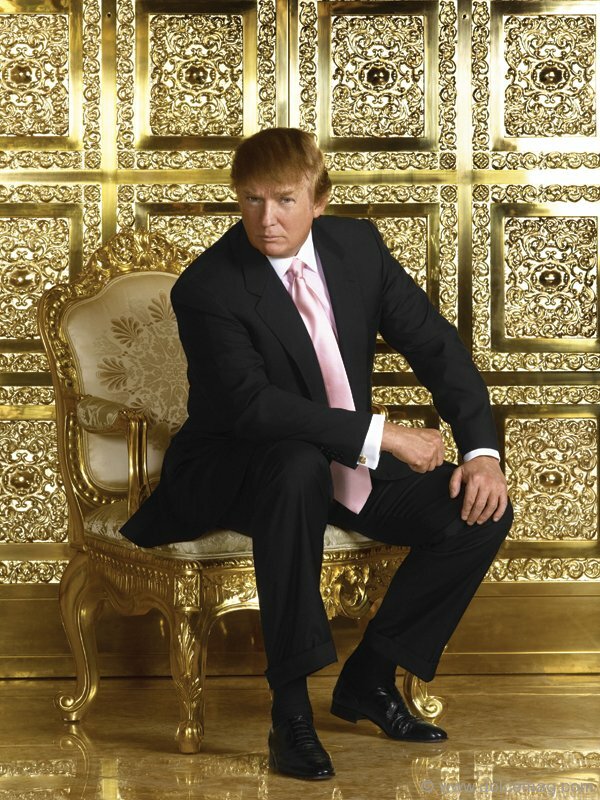 Like Trump, whose father was real estate developer Fred Trump, Set is no self-made God who pulled himself up by his gold-plated bootstraps. Everything he does is an attempt to escape from his father's flaming shadow. This movie isn't good. I can't in good conscience recommend it -- and I go to bat for Jupiter Ascending. But there's something gonzo and invigorating about the whole thing, particularly Butler's sneering, buffoonish performance. Studio executives have long tried to trick the American public into thinking Gerard Butler is charming, likable, and should be in movies with Katherine Heigl. He's none of those things. But as a Trump-like god who takes pleasure in the misery of others? He's perfect. And the best part? None of it's real. Dan Jackson is a staff writer at Thrillist Entertainment and he still likes Dark City. He's on Twitter: @danielvjackson.